Forget about France and the big carp that can be caught there. Thailand is the land of the giants for carp fishing. Carp are known for their hard fighting nature so imagine the possibility of battling a fish the size of a heavyweight boxer. This is fishing in Thailand! Thailand is home to some of the world's largest carp species. 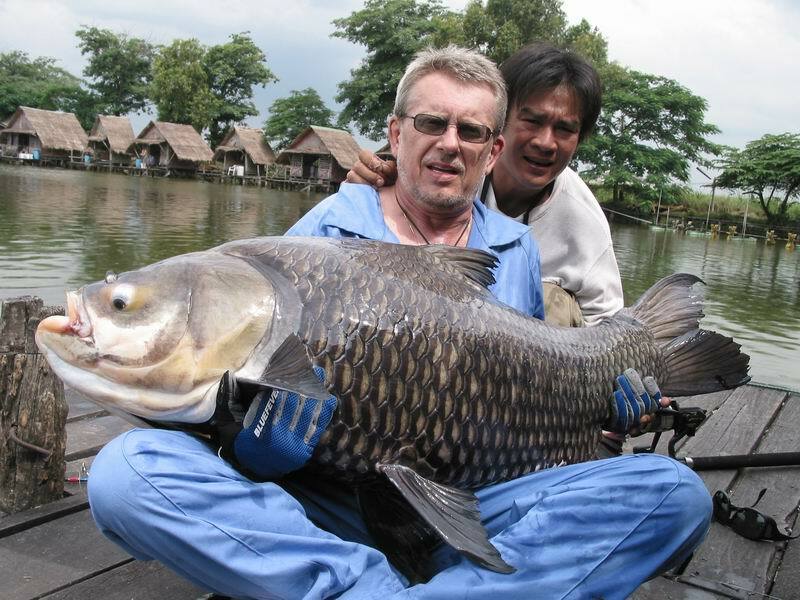 In fact the Giant Siamese carp (Catlocarpio siamensis) is the largest of all carp species in the world and has been reported at 300kg (661lb) a catch that if it had been scientifically recorded could weigh the species in as the confirmed second largest freshwater fish in the world. Jullien's Golden price carp or Isok barb (Probarbus jullieni) can grow to well over 30kg (66lb) and have been recorded at 70kg (154lb). The Big head carp (Aristichthys nobilis) or Chinese carp can grow to over 50Kg (110lb), both of these species are easily big enough to test even the most experienced of anglers. There is another big one called the Rohu (Labeo rohita) or Indian Carp which is also very sought after by many Thai and foreign anglers and is a very desirable food fish in many Asian countries. This Big Carp species has a Max size of around 45Kg (99lb). There are many other smaller species of carp in Thailand such as the Common carp (Cyprinus carpio) which oddly does not grow to anywhere near the proportions of its European or Canadian cousins (10lb fish would be considered huge). Carp fishing tackle and tactics in Thailand are centered around the method feeder with various styles being employed from home-made wire coil devices to custom made plastic molded European carp fishing style feeders. Baits used on the feeders are usually bread mix or rice flour known as (lum) in Thai. All sorts of natural and synthetic additives, scents, flavourings and "secret" ingredients are then added to the mix by the angler or fishing guide to his own specification. Pre-baiting to varying degrees is almost essential to ensure good catches outside of fishing parks and resorts. For hook-baits most common now for carp fishing in Thailand are small polystyrene or cork balls which are popped up on hair rigs. These are unwittingly sucked in by the carp feeding on the ground-bait thus hooking themselves in the process. Bread is also commonly used. Articles such as worms, grubs or even nuts presented over ground-bait as an attractor can be very effective, although smaller fish intercepting can be a nuisance. Boilies are known to work in some western run fisheries but rarely if ever in Thai fishing parks. Floating and surface baits can be really fun. Dog biscuits super-glued to a fly hook or fake bread flies can get takes on the drop in lakes and fishing parks where the fish are confident in surface feeding.